The Ouachita River begins at an elevation of about 1900 feet on the south slope of the east end of Black Fork Mountain north of the little village of Rich Mountain on US 270 about two miles west of Eagleton, Arkansas. The Ouachita National Recreational Trail begins about a mile west of Eagleton on the bank of the river. 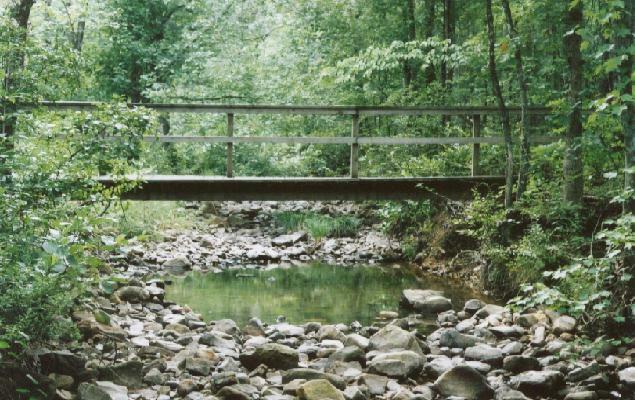 The foot bridge in this photo is on the Black Fork Mountain leg of the trail just 50 feet or so from the parking lot at the trailhead. The elevation at the bridge is about 1500 feet. 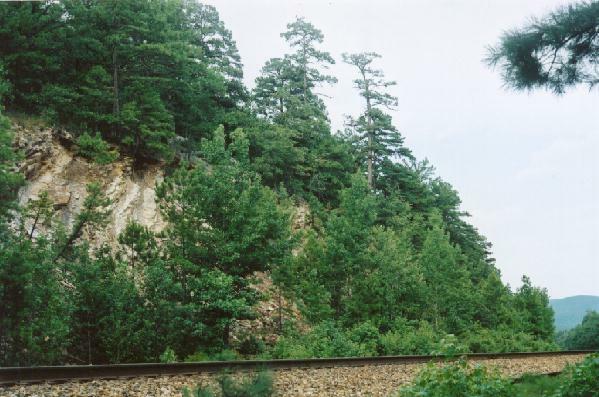 The river flows through a narrow valley with US 270 on one side and a railroad on the other. Debris lodged in the underbrush indicates that the river may fill this area to a depth of several feet and a width of 50 feet or more during heavy rains. The railroad is about 12 feet up a steep bank from the foot bridge as shown in the next photo.